Ace sci-fi/synth driven steppers from Matt-U for Boka. 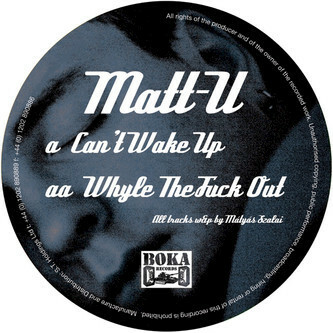 Both 'Can't Wake Up' and 'Whyle The F*ck Out' take cues from the neurofunk end of the D'n'B spectrum with surging mid-range (but not ravey wobble) synthlines and loping, halfsteppers beats. For fans of TRG, Headhunter and Noah D this is a must!